There are two new posters, one with Tyrael, the other featuring that black, scorched lizard skull style Diablo we saw on the new Battle.net box art, a Skeleton King mug, and my personal favorite, the Diablo III beach towel. Also note the authentic Rainbow Level shirt; that shirt was created exclusively for the D3 Dev Team and debuted at Blizzcon 2008, in response to the Art Controversy — a seminal event in the early history of the Diablo III community that’s probably entirely unknown to 95% of the people the beta has drawn in. Featuring the BlizzCon 2011 artwork by Glenn Rane from Diablo® III. This year’s Key Art is TOP SECRET until the Opening Ceremonies at BlizzCon. That seems like a Diablo III box art reveal, doesn’t it? I mean what else could it be? And yet Neinball tells us that the “Key Art” for all three Blizzard franchises is being handled in that fashion. What new piece of artwork could they have for SC2 or WoW that they will only reveal at the Blizzcon opening ceremonies? Maybe box art for all three games, with the SC2 expansion due in mid-2012, and another WoW expansion in the works and likely to be debuted at Blizzcon next month? I can’t think of anything for SC2 that would really be all that secret. WoW could be something from the yet unannounced expansion they’ll most likely be debuting at Blizzcon and as Flux pointed out it could be some of the D3 box art. Could it some how be Titan related? Only about another month to go. Unless someone leaks some images from the plant they’re being made at like the WotLK and SC2 boxes were. I’m actually kinda disappointed in this loot. Nothing I want to buy this year. Where’s all the cool stuff they previewed at that event a few months ago?! I’m guessing Jynx is either going to sell it from their own store at Blizzcon or wait until the winter collection in Nov.
How could the shirt be any gayer? only 13 year old girls can wear that. It takes a REAL man to battle ponies that fire rainbows out of their asses. Where is the Tyrael Hoodie??!? Where was that blue post made? I couldn’t find it on the blizzcon site anywhere. This “exclusive merchandise” always pisses me off a bit since its a crap shoot on whether or not you’ll ever be able to obtain a ticket to blizzcon. Virtual pass? Being forced to subscribe to a service so I can watch select parts of a show? No thanks I’m not that much of a sucker. That’s weird… usually the art they use on the header of the blizzcon site is the art they use for the key art poster… unless there’s a 4th unrevealed image to go on it?! 😯 And I must have that shirt!!! It will be very lame, as often in Blizzard’s case. I really hope you’ll be able to buy the D3 poster in the normal Blizz store after Blizzcon. Lame indeed, everytime they promise something huge, it turns out the exact opposite case. And lol at all the people who expected the start of the proper beta tod…….yesterday! It’s funny. I was stoked, really, excited as hell that the CE might include a version of the D3 pony logo shirt the devs were wearing. And now it’s actually coming out as merch and all I can think is that if I wear that Bronies will take it as incentive to approach me in public. My enthusiasm has been understandably dampened. 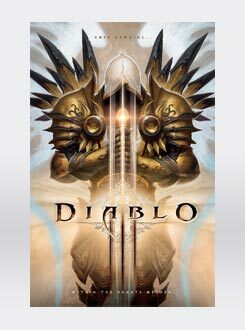 Everybody’s talking about Titan, WoW and SC2, even though it says the key art is from Diablo III. Am I missing something? I believe the key art for Blizzcon 2011, has been shown already or well parts of it anyway – the images of Kerrigan, Thrall and Diablo (those were done by Glenn Rane). Diablo, Mephisto, Baal in D3?